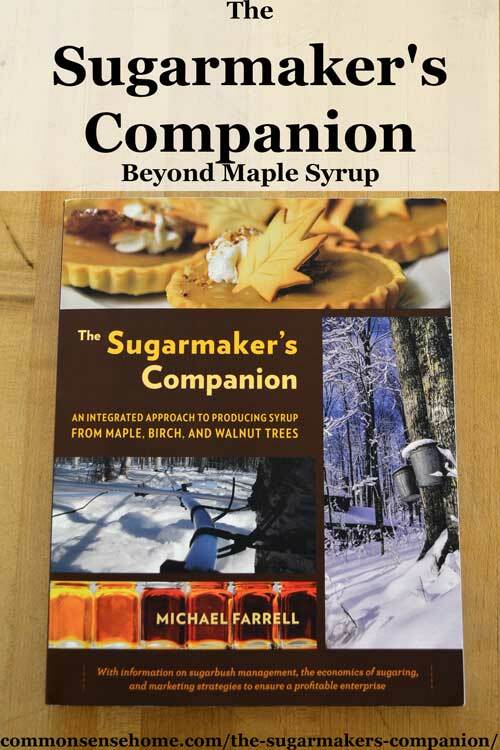 The Sugarmaker's Companion: An Integrated Approach to Producing Syrup from Maple, Birch, and Walnut Trees by Michael Farrell focuses on the business of syrup and sugar making. If you want to tap maples or other trees for profit, this book is a worthwhile investment. Even if you don't have trees, the book still has merit for small producers of many types. Producing an excellent product is no longer enough – you have to be able to market it, and create value added products. Those often overlooked areas are what keep small farms alive. 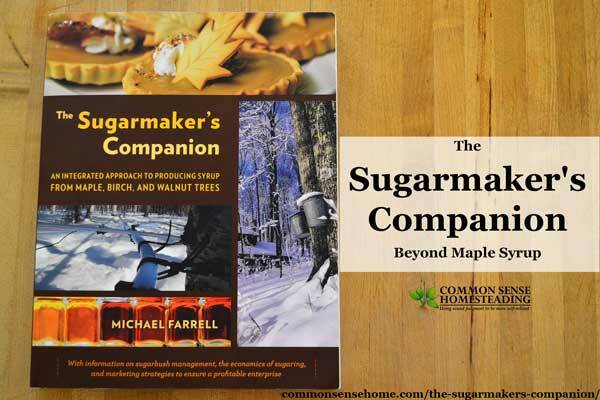 From sugarbush management to creating a successful long term business, The Sugarmaker's Companion is a solid resource. There are over 300 pages of detailed information, with full color photos throughout. The resource section provides information on Books; Organizations; Websites and Trade publications; and Special Events in the sap production industry. 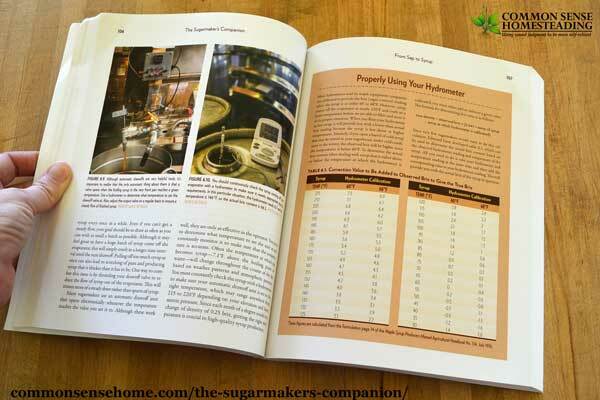 What's in The Sugarmaker's Companion? The author's passion for all things maple permeates his writing. Sometimes he may a bit overzealous in his enthusiasm, but I prefer someone hitting me with everything that's possible over naysayers that tell me everything that can't be done. A recurring theme in the text is preserving our woodlands by putting them to use. I think this is key to preserving many of our assets. People don't appreciate things they don't know and interact with on a regular basis. This is why homesteading and increasing self-reliance changes lives. If you have a part in everything that goes into a meal, from the first seeds planted in the ground to harvesting and preparing it for your table, you never take a meal for granted. If we locally produced our sweeteners from sugarbushes instead of having a market flooded with industrial scale corn, beet and cane sugar, I think the obesity epidemic would take an abrupt turn for the better. Those of you who are regular readers know that I'm a huge fan of permaculture. While sugaring and sap production isn't commonly considered in many permaculture designs, chapter 14 (other non-timber products from your land) dovetails nicely with many permaculture principles. There are many more, but that could encompass a book by itself. Decorative items and specialty wood products may also be options, depending on the size and diversity of your woodlands. Another topic that caught my attention was the widespread use of various types of sap around the world. The book Backyard Medicine talks about drinking birch sap as a health tonic, but had no idea that sap is sold commercially. Since it takes around 40 gallons of sap to produce one gallon of maple syrup, selling sap directly may be more cost effective for those with a limited number of trees. You provide a healthy beverage, and you don't need to invest in the infrastructure for syrup making. Research indicates that maple sap acts as a hangover cure, so marketing opportunities abound. Perhaps one of the most appealing aspects of sugarbush culture is the links it creates between generations. Unlike a typical vegetable garden, trees last for years. Properly maintained sugarbush properties last for decades – or even longer. Sugarmaking lends itself to family time and community building. With planning, multiple income sources can be created from one piece of land. This makes it more likely that additional family members can make a living from the land. Sap-producing trees are a wonderful resource that can be a boon to local economies. My hope is that the growing interest in healthier food options will help rekindle the growth of this industry, and create more opportunities for small farmers. 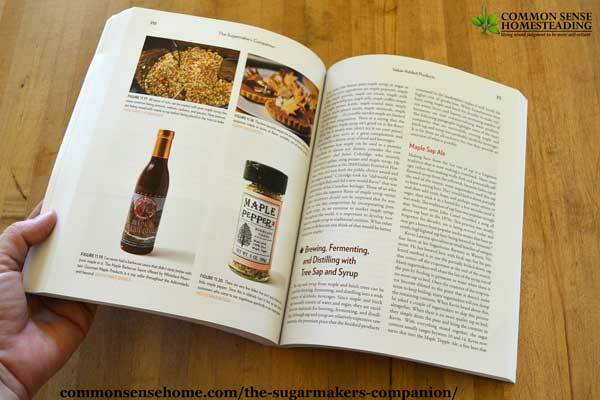 The Sugarmaker's Companion can be a part a part of that journey. I received a copy of the book for review from Chelsea Green Publishing. As always, my opinions are my own. Great review. Do you have a different affiliate link for amazon.ca? Checked to see if I can grab a different link for amazon.ca, but it won’t let me sign into anything except amazon.com (since I’m in the States). Thank you for asking.